I was decorating last year with Magnolia leaves and branches. Here we are in a new season and my tradition continues. I shared my wreaths and garlands from last year a few weeks ago. staying fresh and waiting to be brought inside. to see how and which ones to use for a swag, wreath and garland. This years leaves are huge! I use painters tape to hold the stems together. Once I like the shape and design I add a wire for hanging. It looks something like this and ready to add a ribbon and hang. And here it is over the inspirational art piece I hung over my sofa this year. You noticed the ribbon is off center. I like to do that as I find it more pleasing then always having everything even. Next I created a wreath. Different from the design of last year. This one is smaller and shaped a little different. I hot glue the leaves all around the top, inside and out. Add jute to the back for hanging. Then I added silver stars also from the Dollar Tree and a red ribbon for color. and hangs in my kitchen. I also added little lights for an evening glow. Dressed in white with glittery trees and vintage ornaments. The family room is topped in a different way. dishes with snow village and trees. is my parents one Sunday going off to church. This was a few years before they passed away. will last about 3 weeks. Long about the new year, they will be ready to keep dry or toss out. bunch of cuttings for next year. Thanks for stopping by, your visits and comments. So nice to have you along. Good Morning, I love magnolia trees and your cuttings have made lovely swags and wreaths. Thanks for sharing your creative ideas and I adore the photo of your parents. We miss our loved ones each day, but especially at the holidays, don't we? Wishing you a very nice Thursday. Celeste, I loved it all...but especially the way you decorated the top of your hutch in the dining room and also the one in the family room. They both are beautiful. Your decorating is always in such good taste...always. Hugs to you, my friend, and wishes for a wonderful weekend. Your touches with the magnolias are beautiful! You are so lucky to be able to collect them right at home from your tree! The hutches are beautiful. Love the vintage ornaments, glittery trees and the snow village pieces! I'm not familiar with magnolia trees, but thanks to you I can see how beautiful they are when used to make swags and wreaths. I love fresh Magnolia leaves! Your choice of adding Magnolia leaves really added fullness to your garlands!They looks so pretty on top of your hutches. Your wreaths are so pretty and festive! The photo of your parents is so sweet. I know you miss them. It seems the holidays bring back so many precious memories for me; my mother passed away 24 years ago. Your home is so pretty and festive! Thanks for sharing it with us. Very pretty. Love your homemade Magnolia wreaths and swags. They are beautiful. Celestina, Our Magnolia tree leaves created a beautiful fantastic evergreen look. Thanks for surprising me with your hard work again! I love magnolia leaves and you have created some beautiful Christmas decorations with yours! I had no idea you could do this with Magnolia leaves. Your greenery looks so pretty, my friend. And seeing glimpses of your home is simply magical! Have a wonderful day. Love and hugs! How beautiful are those creations you have made, dear Celestina! Magnolias do not grow on these parts of the country but I know of a florist in the area that supplies them, in fact, the name of the shop is Magnolia's. 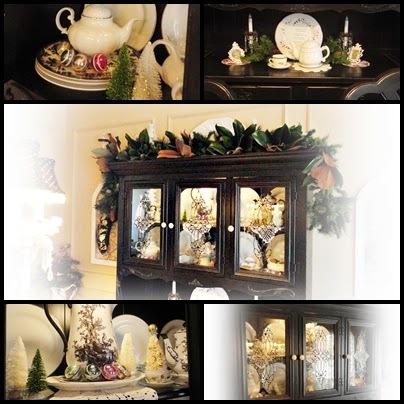 Your dining room hutch is absolutely gorgeous! And that photo of your parents going to church, priceless. What a lovely visit this was. Your Magnolia leaves you beautifully crafted into your swags and wreaths look gorgeous and regal. 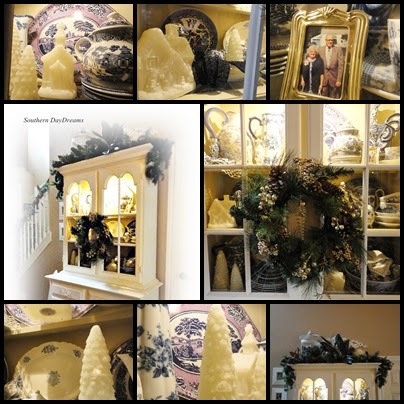 I have always loved the elegance Southern homes present during the Holidays. Here in the North East we have boxwood and pine and fir greens made into wreaths. Which I also love, thank you for sharing all the beauty you create. Hi Celeste! Oh, the magnolia leaves are gorgeous, especially the way you've arranged them! Your talent is never ending. I love your hutches with all of the Christmasing! I love magnolia leaves!! Everything looks so pretty Celeste! Good evening beautiful friend! I came earlier from school off my tablet but I couldn't comment, but how I love these magnolia leaves and how fortunate that you have them in your area. We do have magnolia trees, but the leaves are all off now for us! Your arrangements are gorgeous and I imagine that walking into your home must be enchanting with all the perfectly arranged beauty. The weekend is coming, I have finals week then I'm off for two weeks. I AM SO THRILLED! Those magnolia leaves are gorgeous, and add such Southern charm and elegance to your home. Lovely to have natural touches in your home, and also you don't have to worry about storing them. The hutch looks beautiful, and what a nice picture of your parents. I saw your skates over at Stephanie's -- beautiful!! The wreath with the stars: just stunning! Oh I love your magnolia leave decorations - everything is perfect. You do such beautiful work. Love the hutch with all your pretties. What a great picture of your parents. Love the magnolia pieces that you made...so pretty! I love simplicity during the holidays. This is simple and yet, so lovely. Thanks for sharing. your magnolia creations are beautiful, celeste! lucky you to have a tree:) and your lighted cabinets are so charming, esp. with a picture of your partents:) thanks for sharing this great project with us! Gorgeous! Your magnolia ornaments are gorgeous! The white cabinet is absolutley beautiful!!! I love it very much and your blue and white porcelain is fantastic. Your decorations made with Magnolia leaves are lovely, Celestina! They add a richness to your home for the holidays. I would absolutely love to have my own magnolia tree! Their leaves are a long time favorite of mine. You made perfect use of them too in your lovely home. I've always wanted a magnolia tree. Your swags and wreaths look so pretty Celestina. I love the photo of your parents headed to church. So sweet. A special special photo for sure. We have about 200 cedar trees on our property.. not Christmas but more for privacy but they're green all year long. I'm thinking about making a wreath that I could easily change the cedar out during the year. We'll see. Hope you're having a good Monday. Aren't the Magnolia leaves so shiny and glossy and I love the swags and wreaths you have made from them. Your home is looking so cozy and magical with all your gorgeous touches for Christmas.